"A Woman Playing a Woman? Where's the Trick in That?" The title of this post ("A Woman Playing a Woman? Where's the Trick in That?") is a line from the 2004 film Stage Beauty--the question is posed by the actor Edward Kynaston, who had become famous on the English stage by playing female roles. 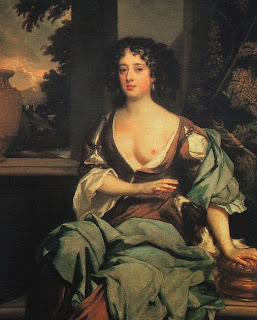 The English diarist Samuel Pepys called Kynaston "the loveliest lady that ever I saw in my life." From the beginning, all the roles in the Elizabethan public theaters had been played by men--in contrast to the practices on the continent, where women performed the roles of women. But on 8 December 1660, shortly after the restoration of Charles II to the throne of England, an English woman played the role of a female character for the first time on the stage of a commercial theater. It's interesting that we know the role that the woman played--Desdemona, from Shakespeare's Othello. We know the company with whom she performed--Thomas Killigrew's King's Company. We know the theater--the Vere Street Theatre. But we don't know the name of the actor. It may have been Margaret Hughes or it may have been Anne Marshall, both of whom went on to gain fame as actors on the Restoration stage. If you'd like to read more, I recommend starting with Stephen Orgel's foundational essay, "Nobody's Perfect: Or, Why Did the English Stage Take Boys for Women?" originally published in 1989 in the South Atlantic Quarterly. This essay also begins Orgel's 1996 Impersonations: The Performance of Gender in Shakespeare's England.